Instead of relegating desktops to a lower priority while pursuing the mobile device market, Microsoft will integrate its PC dominance into its current core strategy to become a devices and services company, opening keynotes at the company's 2014 Build developer conference suggest. "We want our users to think about the Windows family of devices, and the consistency of the user experiences," said Microsoft CEO Satya Nadella, speaking Wednesday at the conference in San Francisco. While Microsoft lacks significant market share in the mobile and tablet space, it does have 1.5 billion Windows users worldwide, and is working to bridge these computing worlds. Developers will also see a consistent experience no matter which Microsoft platform they work with. "We started out as a tools company, before we were an Office company or a Windows company," Nadella said. "Again, we are in that era" of serving multiple platforms and form factors. In this light, the Build keynotes introduced a number of updates and plans around the theme of unifying the Windows experience, for both users and developers, across the company's variations of Windows, including Windows 8 desktop and Modern interfaces, Windows Phone and Xbox. The company also announced Windows Phone 8.1 and the first update of Windows 8.1, along with a number of Nokia phones and assorted developer tools. The Windows Runtime architecture will allow developers to develop a single code base for an application that can run across Windows desktop, Windows Phone and, eventually, the Xbox, explained David Treadwell, Microsoft corporate vice president of the operating system group. He demonstrated how a single app can have the same interface for mobile, tablet and desktop interfaces, or the developer can customize the interface for each form factor. An update to the company's Visual Studio IDE (Integrated development environment) will allow developers to store a common base of application code and keep separate folders for customizations for each separate platform. The company also announced that it would provide Windows 8 and Windows RT for free to OEMs (original equipment manufacturers) for devices with screens smaller than 9 inches. 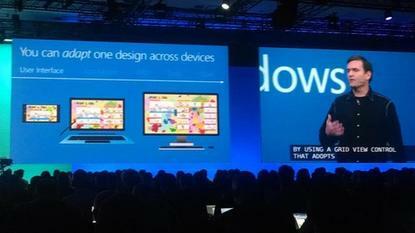 Microsoft is also extending this unified Windows approach for its app store as well. Now once a user buys an app in the store, they can have the rights to use both the mobile and the desktop version. This potentially opens a new revenue stream for Windows phone developers because they can now sell desktop versions of their programs to Microsoft's large Windows user base, Nadella noted. This unified approach could also benefit users, as all their documents can be shared across all the devices, through Microsoft's cloud storage. When Microsoft first introduced Windows 8, it had gotten a fair amount of criticism for not providing an optimal experience for non-touchscreen desktop users. With the release of the Windows 8.1 Update, the company has injected some of the favored desktop tools into the Modern touch interface. The toolbar, long a staple of the Windows desktop, can now pop up on the Modern interface and right-click commands have been enabled to work in the interface as well. Also the Windows desktop start menu now can incorporate links to applications from the Modern interface. The company is also moving Windows Phone development aggressively, with new features in the newly announced Windows Phone 8.1 that the company hopes will make it challenge Android and Apple iOS capabilities. Perhaps most notably, Windows Phone now has a personal assistant, called Cortana. As with Apple's Siri or Google Now, the user can ask Cortana a question and it will return an answer, on screen and in a computerized voice. For a competitive edge, Microsoft has done a lot of work in using context to provide more relevant information and has wired Cortana to Bing to enhance the results with Bing's structured information. Cortana can also scan a user's email and calendar to suggest actions, such as getting ready to meet someone. The company also took time to bring the recent acquisition of Nokia's devices and services arm closer into the Microsoft ecosystem. Nokia employees are about to become full-fledged Microsoft employees, noted Stephen Elop, Nokia executive vice president for devices and services. Elop also introduced the next line of Nokia phones. The flagship Lumia 930 features wireless charging, a 10-megapixel camera, and advanced audio recording capabilities. It will retail for US$599 and be available beginning in June. Elop also introduced lower cost models the Lumia 630 and Lumia 635. The 635 has 4G connectivity and the Lumia 630 uses 3G. One version of the 630 can run two SIM cards, which allows the user to have two call paths from a single phone to keep work and personal calls separate, for instance.